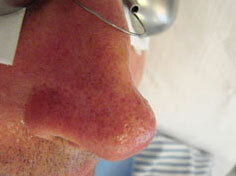 Facial thread veins can now easily be erased by a vascular laser with immediate results. Dr. Dhobb is using a specific vascular laser that is targeting selectively the diseased vessels. 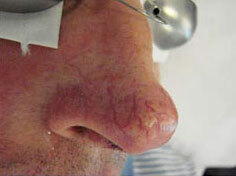 This new proven technology has revolutionised the treatment of unsightly facial thread veins. One to two sessions will radically eliminate those telangiectasias with no side effects. To improve the accuracy and precision of laser therapy, Dr. Dhobb uses a unique polarized light system specially manufactured ensuring a precise identification of the diseased vessel. Patients can resume a normal life immediately after facial vein treatment. This technique is erasing the unsightly veins and improves the quality of the skin in the treated area. 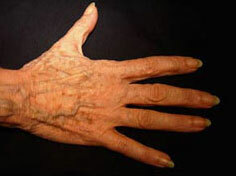 Microsurgical treatment or injection therapy is used to treat large bulging hand veins that are unsighty and give an “old look”. 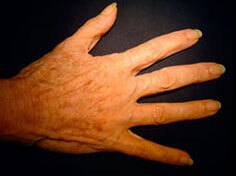 This offers a fast and virtually painless way to have younger looking hands. The results are dramatic and long lasting.